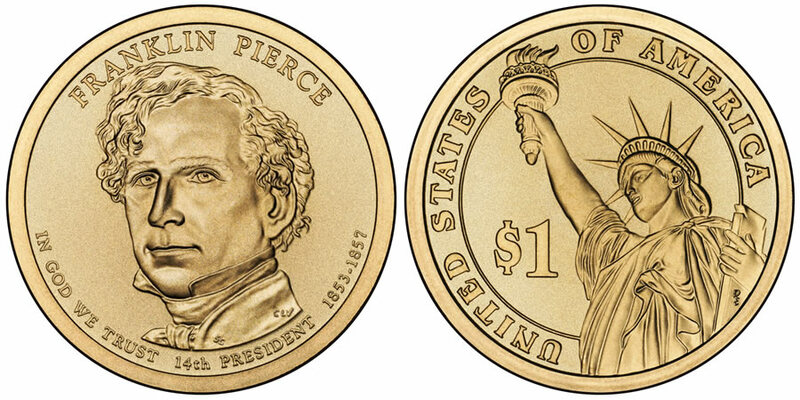 The Franklin Pierce Presidential $1 Coin honors the 14th President of the United States and is the second coin to be released in the series for 2010. The program started in 2007. Elected as a "dark-horse" candidate, Pierce was known for his support of the Compromise of 1850 which gave the country a temporary, if not poor, solution to the political storm surrounding the slavery issue. Due to his Southern sympathies, Pierce narrowly won the election over Gen. Winfield Scott who the South was unsure of. A mere two months before his inauguration, Pierce and his wife Jane lost their only surviving son to a freak train accident. Grief stricken and blamed for their sons death by his wife, Pierce entered the White House in mourning. Franklin Pierce's portrait (designed by Susan Gamble) is centered on the obverse and was engraved by Charles L. Vickers. Over Pierce's head is his name "FRANKLIN PIERCE " and underneath him "IN GOD WE TRUST," "14TH PRESIDENT" and "1853-1857". The image of the Statue of Liberty that is featured on the reverse of the Pierce Presidential $1 Coin was designed by Don Everhart and is seen on all of the presidential dollars. Circling the edge is "UNITED STATES OF AMERICA" and "$1" is shown to the left of the image.